There they go again….both The Nation and its ally in spreading falsehoods, “Democracy-NC,” are intentionally spreading misinformation. “How so?” you ask…..let’s count the ways……. In its recent report, Democracy-NC, 2014 claims that 452 people who voted in NC’s May primaries were “disenfranchised” due to elimination of NC’s Same Day Registration (“SDR”) which occurred in January of this year. In doing so, Democracy-NC deliberately conflated certain NON-approved provisional ballots with elimination of same day registration. The scantest of evidence was provided to support this allegation…..a total of 12 anecdotal “stories from their list of “disenfranchised” voters. When examined, each of these stories reveal that either someone at the polling place made an error, or the voter was personally irresponsible. In short, NONE were disenfranchised. More on that later…..
Democracy-NC also “forgot” to mention a number of other things…. Same day registration was only permitted in NC for the period of six years, 2007-2013. What did people do before 2007? Same day registration is currently allowed by only a small handful of states; primarily in states that have no early voting. What do people do in those states? Of the 452 alleged disenfranchised voters, 301 registered on Election Day. The old law did not permit same day registration on Election Day proper. So much for the claim of disenfranchising those 301 voters. Most of those 3313 provisional ballots were approved, and often for the same reasons that others were rejected. This is a system failure, not a legislative failure, and must be addressed by the State Board of Election. Of course, no one should be denied their vote because of polling place errors but to construe this as the result eliminating SDR doubles that error. By current law and regulation, everyone who enters a polling place and wishes to vote will be allowed to cast a ballot. (See § 163-166.11 of the NC General Statutes). That vote may or may not be counted based on the facts as determined by the election canvass process. “The voters who cast the 454 rejected provisional ballots come from every walk of life, and are of all parties, races, and age groups. But their composition is startling because it reveals that the new rules are indeed affecting African Americans and other people of color much more than white voters, and Democrats more than Republicans. Really? First they ‘hand-select’ only those voters they wish to include in their sample. Then they conclude, based on a biased statistic deliberately contrived to give you, the reader, a distorted view of reality — that the election reform’s elimination of same day registration is somehow designed to adversely affect non-whites. This is deception at the basest of levels. Moreover, isn’t it insulting to our NC black voters to infer they are somehow less capable of remaining properly registered as whites are, or can’t seem to remember what precinct they’re supposed to vote in? Again, Democracy-NC, REALLY? The number of who cast provisional ballots NOT counted. 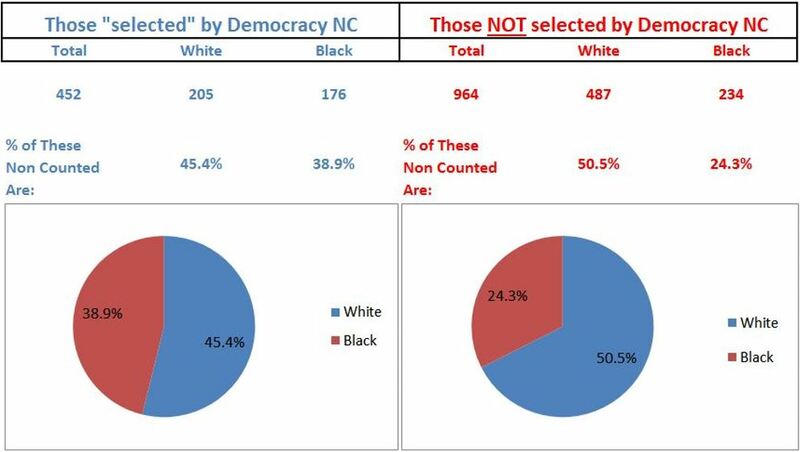 The “cherry-picked” Democracy-NC data (452 selected from 1409 NOT COUNTED provisional ballots) shows a higher percentage of blacks whose ballots were not counted – because Democracy-NC over-sampled counties with larger percentages of blacks to begin with. Is Democracy-NC implying that our black citizens are less capable than our white citizens, as it appears? You may also be wondering about the 1691 voters whose provisional ballots were COUNTED. Again, we see the same deceptive Democracy-NC pattern revealed in the graphic to the right. 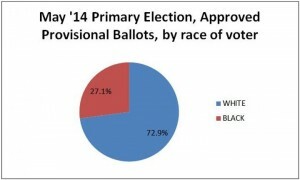 Using Democracy-NC’s “logic,” the COUNTED provisional ballots for black voters would be considered “over-approved” since it (at 27%) is considerably higher than their representation among all voters (19%) in the Primary election). Are we to conclude that the new law eliminating same day registration somehow boosted the approval rate for black voters? We think not. Neither should you. Five Voters did not follow instructions. 2 Election Workers didn’t pay attention during the election training section that advises workers to vote early or absentee if scheduled to work in a different precinct than their own. 1 Felon failed to follow directives to register to vote when he got out of prison. One man voted provisionally in 2012 outside of his precinct. He would have been referred to his proper precinct then, and again, in 2014. One woman moved and did not respond to BOE’s request to verify her move. She showed up at an incorrect precinct, where she would have been sent to the help desk to verify her move and then advised of her precinct. She chose not to go to the correct precinct and to cast a provisional ballot instead. *Precincts only stock their own ballots. People who vote in the wrong precinct will most likely get the wrong ballot and will vote for races/ issues that they are not eligible to vote for. If this was allowed, they could go to another district than their own, for instance, if they knew their congressman had a safe lead, but wanted to help a congressional candidate in another district. Four cases involved errors somewhere in the registration process (even if they happened exactly as Democracy NC claimed). 2 of these cases allegedly point to a failure in the registration process to make it from one entity to the BOE database, not a problem resulting from new election laws. A high school student claims to have been registered at school and another person claims they registered at DMV. A couple moved to a different county and said they filled out a registration that didn’t make it into the database. The anecdote does not indicate where they filled the forms out. Was it through the DMV? Did they mail them in? Did they give it to someone conducting a voter registration drive? One moved to another county and changed her license. NC law has long been that when you move to another county, you are deleted from the first counties’ registration roll. The story does not indicate if she again changed her license when she moved back. If she did, she would have been offered to register to vote at that time. One woman went to college in another county and was registered to vote in her college town and removed from the registration rolls from her home town. More information is needed to know what triggered that change in registration that she apparently didn’t know took place. More information is needed to determine what prompted the remaining example to be dropped from the voter rolls. The BOE doesn’t just drop people from the registration rolls without something triggering that to happen. To read Jay DeLancy’s case-by-case analysis of Democracy NC’s 12 victimized voters, please click here.